Looking Great and Having Fun! A great pic of Kirsten and Chris (AKA the King and Queen of Hearts!) representing at today’s Marin Senior Information Fair. 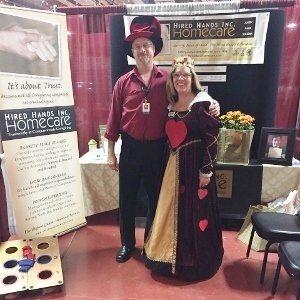 This year’s theme was “Thru the Looking Glass”, and the King and Queen of Hearts enjoyed holding court with all our community partners, providing great information and entertainment for Seniors and their families! Yes, it really does take a village! And, an interesting fact to note… This was our TWENTY-SECOND consecutive Marin Senior Info Fair! So very nice to see so many familiar faces, and to get out in front of the community we’re so proud to serve!